Indeed, the grid of imagery on the Keef Palas account provides a coherent snapshot of its sarcastic-yet-chic ethos. 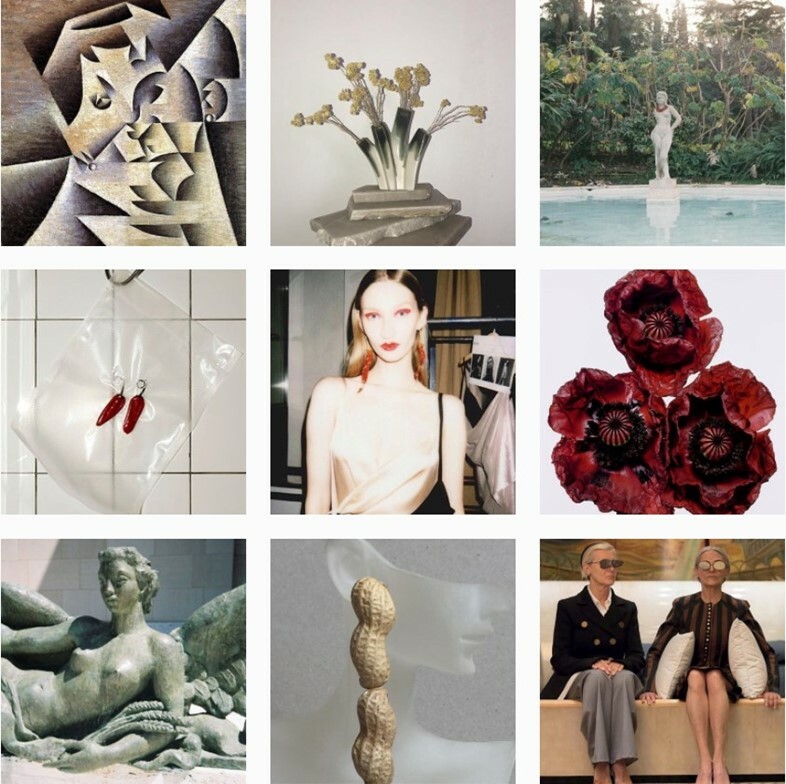 There’s a rather Irving Penn-esque plate of spaghetti on top of which lies baby onion and garlic clove earrings; Picasso and Jean Cocteau artworks next to a video of the brand’s marketing manager getting his ears pierced at Claire’s Accessories, and a marble statue in a museum, a cotton flower hanging from one lobe. Keef Palas has also made a bikini from seashells and starfish, and a pair of eyeglasses from pebbles – captioned “the only way to stand this world: STONED” – with the latter recently photographed in magazine editorials. It’s hardly surprising that with visuals such as these, O’Keefe and Oliva’s work has caught the attention of stylists and editors via the social media platform. “Most of it is all done by ourselves,” explains Oliva of the photography used for the Instagram and look books. “If it’s not credited, it’s ours. And if it’s credited it’s mainly other photographers. We do usually help out with the art direction, though.” At this time pieces are only available to purchase online, but the pair have put on several pop-ups across Europe, with plans to branch out to permanent stockists in bricks and mortar stores later this year. Whether the jewellery that Keef Palas offers in shops will actually sell is beside the point. With the most recent post on its account being an earring made from tamarind, as part of a new collection based on “poo”, not everybody is going to get it. But therein lies its appeal; fashion could do to take itself less seriously, and projects such as Keef Palas – and their subsequent social media accounts – provide much-needed light relief amidst slicker digital aesthetics and consumer-driven media.